Good evening all. I'd like to share a technique with you using a seldom-used product from the catalogue, the stampin' Up pastels. At £22.25 for all of the current colours (except the in colours) they are a bargain! I'd like to say a big thank you to Amanda Fowler at Inspiringinkin.com for her wonderful tutorial on the chalkboard technique used in this card. First start with a dark coloured piece of card stock. 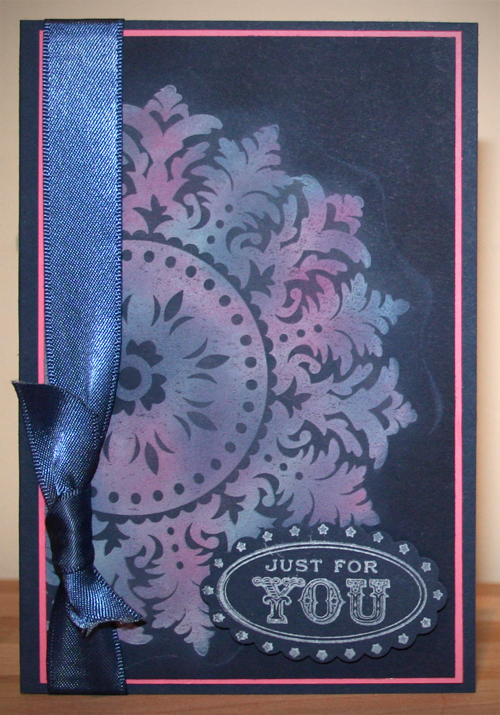 I used Night of Navy here as it is such a lovely deep colour, and worked beautifully with all the purples and pinks in this design. 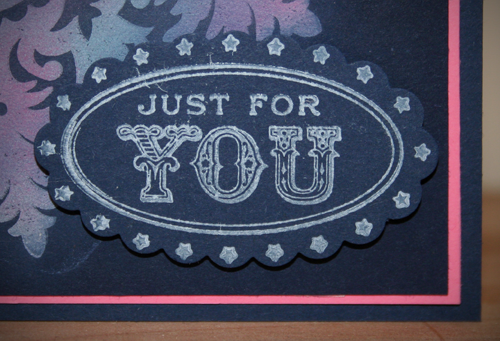 Then ink up a stamp with the craft Whisper White ink pad and stamp onto the dark card stock. Here I used the Medallion stamp, and inked it slightly off the page. Next you take the colours you want to use of the pastels and dab them onto the image. I used a sponge dauber and didn't rub the colours in, I used a kind of stippling effect as the ink is still wet. 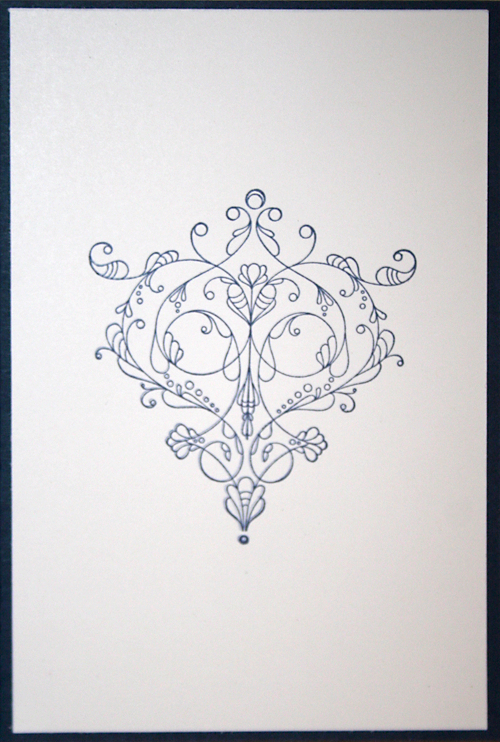 Last, use a paint brush to sweep away the excess pastel dust and Voila you have a gorgeous card! The yummy Night of Navy satin ribbon gives this card an extra sense of luxury, and the Regal Rose matting draws attention to the colours in the medallion. the best part about this technique is that no two cards will be exactly the same. The greeting is from the oh so useful Oval All set and was really simple to ink up, stamp and punch put because of the coordinating products and gave the same chalky effect that the pastels give. Last but not least we come to the inside of the card. It can be quite hard to find a pen that will write on dark card, especially if you are in a rush and writing your cards at the last minute ( not that I would ever be that disorganised!) so I decided to put a white insert into the card and stamp it with this beautiful image from the Always Elegant stamp set. I hope that you liked the card today. You can order Stampin' Up products from me 24 hours a day, email me on cpoxon915@gmail.com or ring me on 07795474490. Anyone who places an order with me this month for £25 or over will get free postage. If there are enough orders for hostess benefits then I will put your name in a draw, one for the stamp set and one for the free products. Why not drop me a line, I'd love to hear from you! 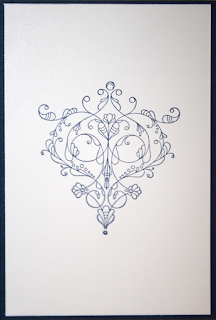 Just LOVELY cards on your blog! Just signed up as a demo - will be following you!